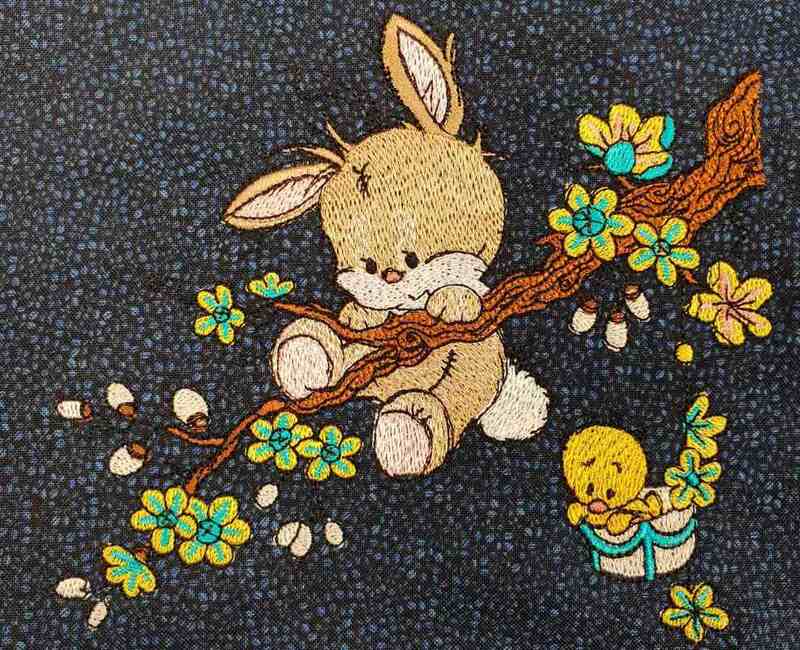 Take a look at this amazing machine embroidery design which features a mischievous bunny. The adorable animal is about to fall down from the tree branch and is barely holding up. It’s a gorgeous spring season outside and the tree is covered in colorful bloom. The color palette in this design comes as a soft pastel mix of emily pink, gold, maize, mid lilac, blue frost, marine gold, rust and others. 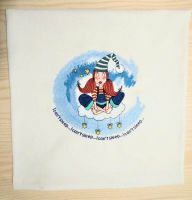 Go ahead and stitch out this fantastic needlework to any of your favorite items: towels, bathrobes, cushions, blankets, pajamas, quilts, napkins, sweaters, T-shirts, hoodies and more. Works perfectly with all fabrics! Thank u for the pretty rabbit pattern! It's exactly what I was looking for to decorate my baby's pillowcases. The plot and the colors are very harmonic with the interior design of her room. Thanks! Love the purchase, can't wait sewing it! 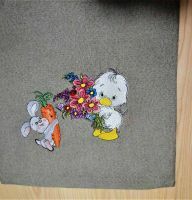 Embroidered the Bunny on home decor things, awesome and cute! Thank u! Great price and perfect quality of the pattern as always. Absolutely LOVE how this stitches out! Stitched out perfectly well with my Pfaff creative, it only a pleasure, thank you so much. Very cute little things for a baby worked out. Another great purchase! Hi – What is the name of this design on bag and cost? I would like to order it but can’t find it on your website. It’s been a few years since I last ordered from you but I have always loved your designs and how well they sew out. . .
Design in this page.Sorry, we not understand your question. I have recently purchased your Bunny Embroidery Design. 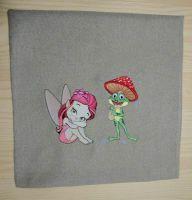 I am a quilt shop owner in Fairy quilt, Texas. I am planning to use the design on one of my store samples. I am wondering if it would be alright for me to embroidery the designs on fabric and put it in the quilt kits for my customers? Yes, without any problem You can use our projects in your business. Machine embroidery is used everywhere. Even so, where usually it is not used. 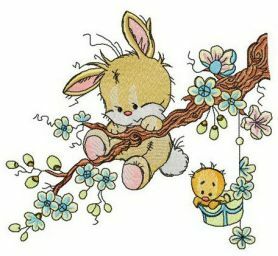 Every lover of needlework has a sewing room or a small corner where you can make your masterpieces. And naturally, as every creative person has a large number of different tools and materials. At the craftswoman of sewing affairs, it is threads, the remains of pieces of fabric, stabilizers and various other things. All this needs storage. Keeping them on the shelves is not always convenient. They are too small, but they can take up a lot of space. It is much better to use small boxes or a basket for this. Well, since you are a creative person, approach the creation of a storage place is not standard. Let this little basket become a masterpiece of sewing and embroidery art too. 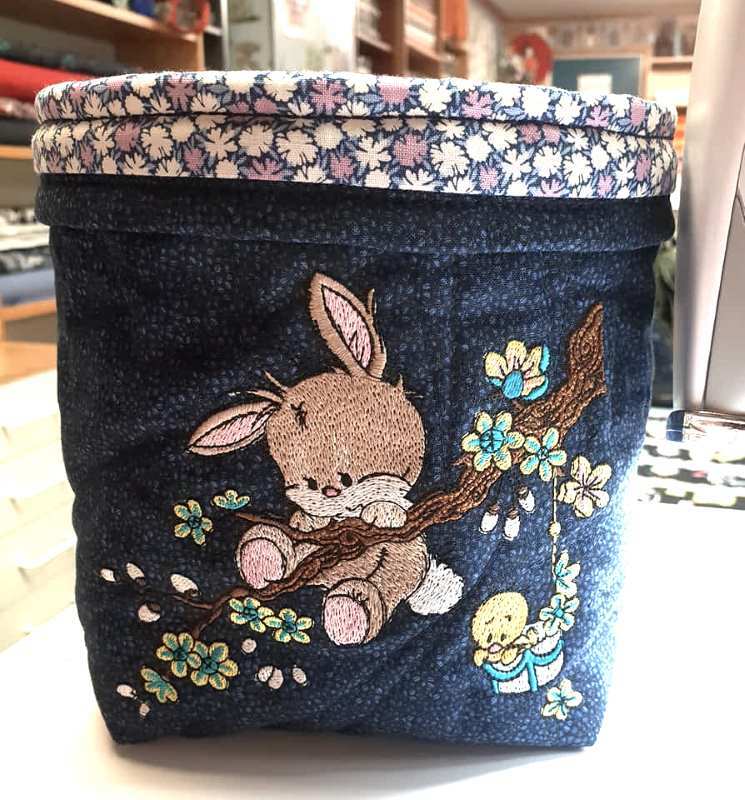 A basket decorated with embroidery can also be a good place to keep newspapers and magazines. In the nursery you can put small toys or parts of the designer. In the room of the student or student, you can store rulers, pens and pencils. Having once made such a product, it will be easy for you to make subsequent ones using various designs. After all, for each case you need a separate story. Also, such a basket can be a good housewarming gift.